A pair of rare birds are nesting in Herefordshire - the first recorded sighting in two years. 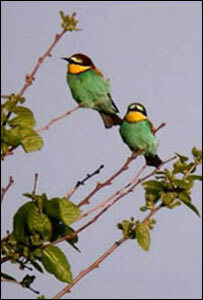 Bird-watchers have flocked to see the colourful bee-eaters who have set up home in a riverbank at Hampton Bishop. Experts believe it is only the fourth time bee-eaters have nested in the UK as they prefer the warmer climate of southern Europe. An RSPB spokesman said: "For most visitors this will be a once in a lifetime experience." He added: "Bee-eaters are among the most stunning birds you will ever see. "These birds are a blaze of colours and when the chicks appear it will be a stunning sight." The birds have dazzling green breast feathers and yellow necks. The RSPB has set up a viewing station and is handing out binoculars and telescopes. There is also round-the-clock surveillance to make sure the nest is not disturbed. In 2002 a pair set up nest in a quarry in Durham. Before that, the last recording of bee-eaters in the UK was in 1955.